One lucky shopper has triumphed over thousands of entrants to win a £500 donation for charity, during a host of activities at The Liberty Shopping Centre’s ‘Summer Festival Of Fun’. 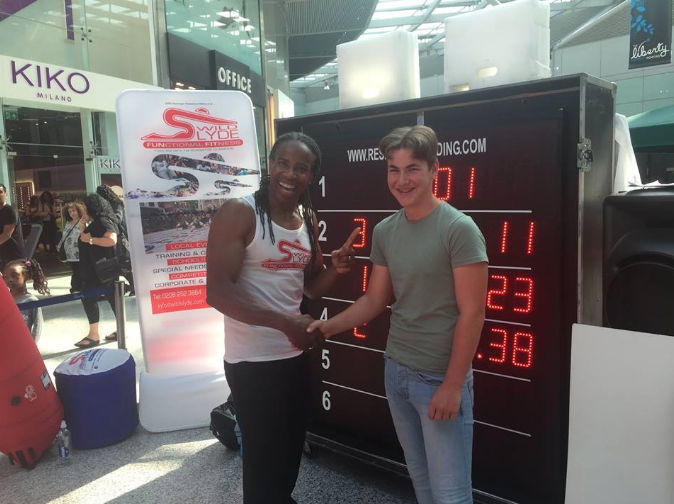 Oliver Taylor from Hornchurch successfully completed The Liberty Shopping Centre’s ‘Wild Slyde’ activity in just 5.36 seconds, making him the fastest ‘slider’, and the winner of the all-important prize donation. ‘Wild Slyde’, created by Weininger Irwin, the UK’s first ‘Gladiators’ champion, returned to the shopping centre to round off the ‘Festival Of Fun’ activity based in the centre, to entertain both kids and adults over the summer holidays. The shopping centre invited shoppers, charities and local businesses to take part in the impact-free sport, for the chance to win the donation. Oliver scooped the £500 for Cancer Research UK, a cancer awareness and research charity. Jonathan Poole, Centre Manager at The Liberty, commented: “It has been a great six weeks of summer fun at The Liberty. Oliver Taylor, winner of ‘Wild Slyde’ said: “I’m feeling really good about winning the Wild Slyde competition.